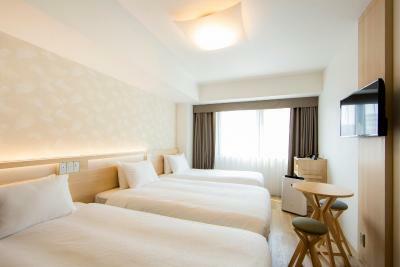 Lock in a great price for Karaksa Hotel Osaka Namba - rated 8.9 by recent guests. 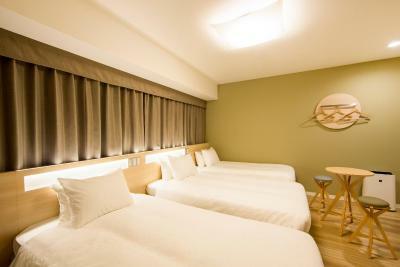 A great hotel in the best area of Osaka. Clean, good size and well appointed. Full block out curtains, comfortable bed and wonderful staff. Location. Free drinks (coffee, soda etc.) through the day. Helpful staff. Clean and cosy environment. Nice staff and shuttle bus to the airport. Separate toilet room. Beds are comfy. Free drinks and snacks provided for free in the afternoon. Location. We really enjoyed our stay here. 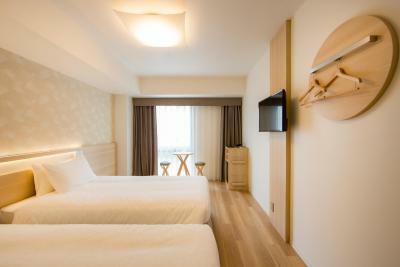 The hotel is conveniently located in the Namba district. Our family of 5 stayed in two connecting rooms and it was perfect. We really enjoyed the breakfast and afternoon snacks/beverages. I would not hesitate to recommend this hotel. It’s within Shinsabashi area, very convenient and lots of restaurants area. Rooms are excellent. Shuttle services. Great location. Near dotonbori and shinsaibashi. 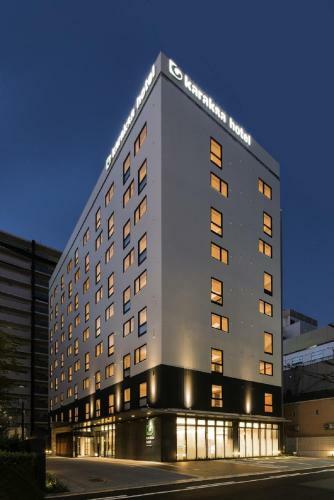 Opening in November 2017, Karaksa Hotel Osaka Namba is conveniently located a 5-minute walk from Subway Namba Station or a 10-minute walk from JR Namba Station or a 15-minute walk from Nankai Dentetsu Namba Station. 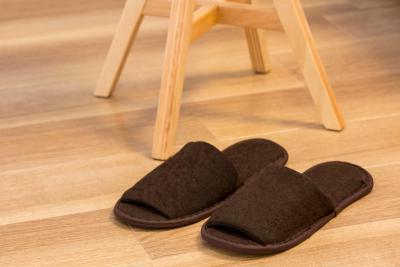 It is only a short stroll away from the busy Dotonbori area and Shinsaibashisuji shopping street. 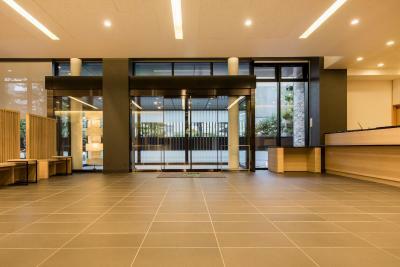 Kyoto, Nara and Kobe cities are also accessible from the property. Free WiFi is available throughout the property. 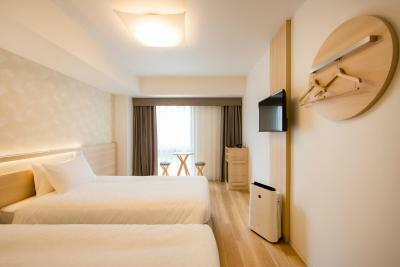 All rooms feature air conditioning, a desk, flat-screen TV, electric kettle and refrigerator. 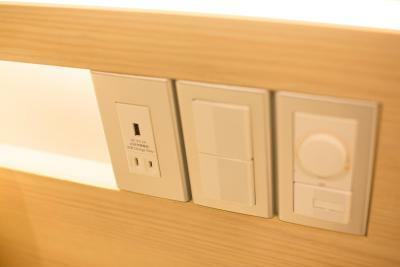 There is a socket near the bed. 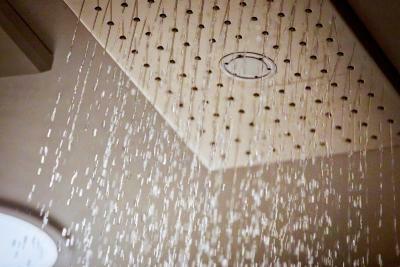 The private bathroom has a hairdryer, slippers, toothbrushes and free toiletries including shampoo, conditioner and body soap. 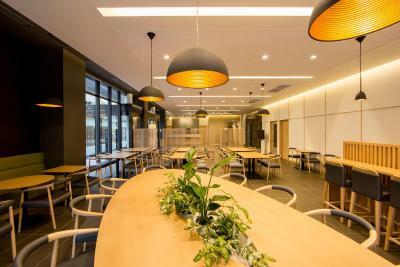 Popular amongst families and groups, several connecting rooms are provided. Free luggage storage is available at the 24-hour front desk at the property. A drinks vending machine is available on site. Guests can enjoy the restaurant buffet at the property. 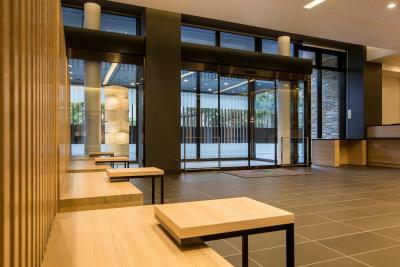 There are several restaurants, cafes and convenience stores within a 3-minute walk from the property. Glico Man Sign is a 4-minute walk from Karaksa Hotel Osaka Namba, while Namba CITY shopping mall is a 12-minute walk away. Guests can reach Osaka Castle in 35 minutes by train. 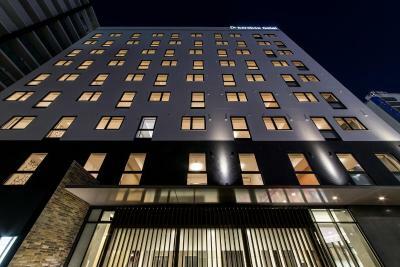 The nearest airport is Osaka Itami Airport, 8.7 miles from Karaksa Hotel Osaka Namba. 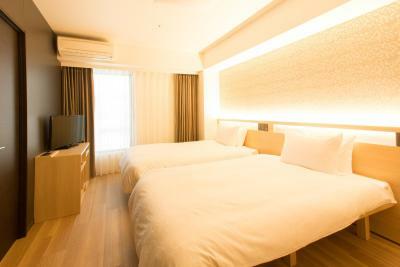 This is our guests' favourite part of Osaka, according to independent reviews. 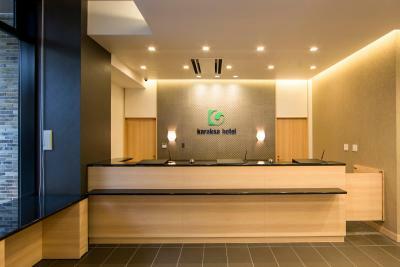 Karaksa Hotel Osaka Namba has been welcoming Booking.com guests since 30 Jun 2017. When would you like to stay at Karaksa Hotel Osaka Namba? 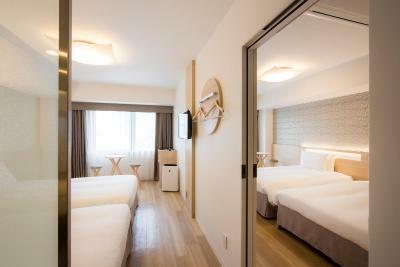 This air-conditioned twin room features a flat-screen TV, an universal power outlet with an USB port, a mini fridge, free toiletries and a hairdryer. The toilets and bathroom are separate. 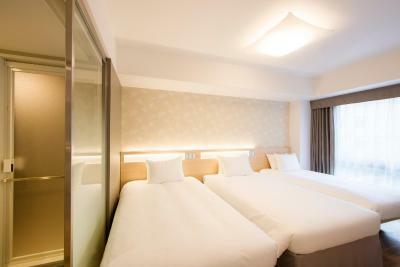 This air-conditioned twin room is equipped with 2 single beds and 1 extra bed. 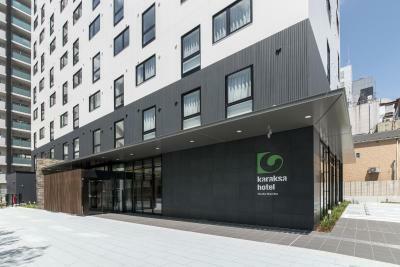 There is a flat-screen TV, an universal power outlet with an USB port, a mini fridge, free toiletries and a hairdryer. The toilets and bathroom are separate. 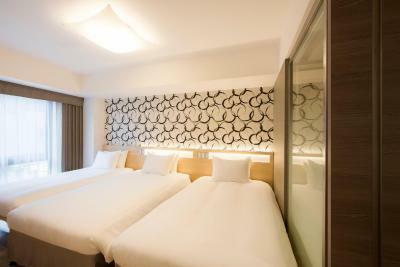 This twin room has air conditioning, a dining area, desk, flat-screen TV, electric kettle and refrigerator. 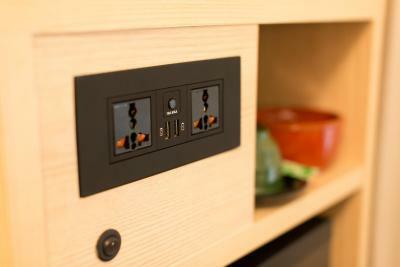 There is a socket near the bed. The private bathroom has a hairdryer, toothbrushes and free toiletries. 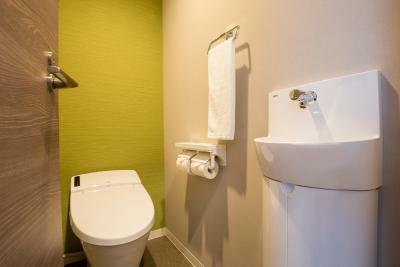 This is a quadruple room where 2 twin rooms are connected and it features a flat-screen TV, an universal power outlet with an USB port, a mini fridge, free toiletries and a hairdryer. The toilets and bathroom are separate. This room is for a maximum of 6 people. There are 4 single beds and 2 extra beds. The room is equipped with a flat-screen TV, an universal power outlet with an USB port, a mini fridge, free toiletries and a hairdryer. The toilets and bathroom are separate. 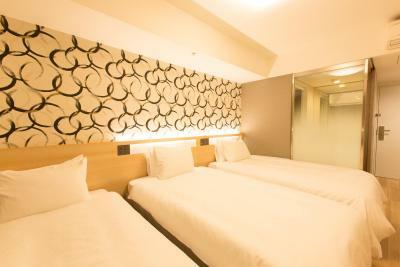 This air-conditioned twin room is located on the 8th or 9th floor and it is equipped with a flat-screen TV, an universal power outlet with an USB port, a mini fridge, free toiletries and a hairdryer. The toilets and bathroom are separate. 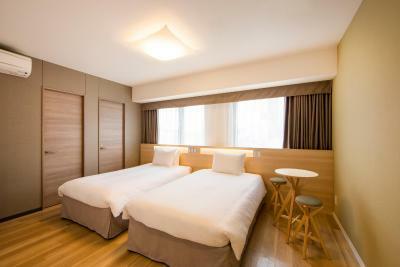 This is a quadruple room where 2 twin rooms are connected. 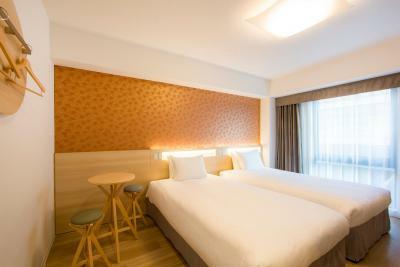 These rooms are located on the 8th or 9th floor and it features a flat-screen TV, an universal power outlet with an USB port, a mini fridge, free toiletries and a hairdryer. The toilets and bathroom are separate. 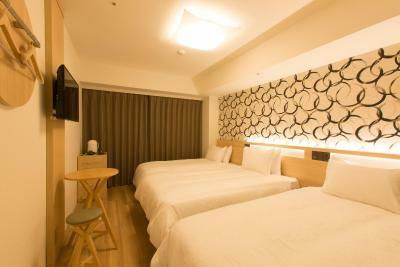 This room is for a maximum of 6 people and is located on the 8th or 9th floor. There are 4 single beds and 2 extra beds. The room is equipped with a flat-screen TV, an universal power outlet with an USB port, a mini fridge, free toiletries and a hairdryer. The toilets and bathroom are separate. 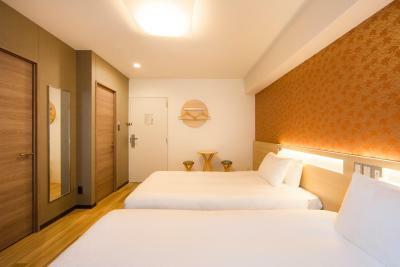 House rules Karaksa Hotel Osaka Namba takes special requests - add in the next step! 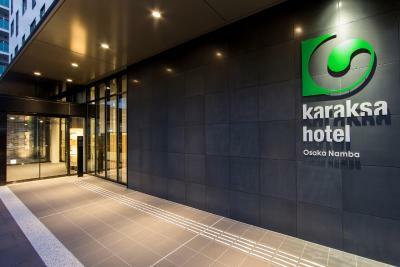 Karaksa Hotel Osaka Namba accepts these cards and reserves the right to temporarily hold an amount prior to arrival. When booking 10 rooms or more, or for 20 persons or more, different policies and additional supplements may apply. Please contact the property directly for more details. The coin-op laundry machines are quite small and really only meant to handle about 3 days worth of clothes for 1 person. Be prepared for that if you plan to do laundry here. If you put in a larger load be ready to run the dry cycle 2 or 3 times. I wouldn't have said the bed was uncomfortable but I had issues with my back and hips that got progressively worse as I stayed here and cleared up when we moved on to the next hotel. No one else in my group seemed to have this issue though. This hotel is conveniently located. It is within walking distance of transit stations, dotonbori and big brand shopping. 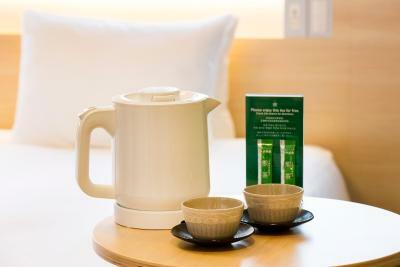 The hotel also has many amenities, including an excellent breakfast buffet with eastern and western food choices, coin-op laundry, and a wide selection of toiletries (near the elevator in the lobby) that you can pick and choose from. Our room, which was actually two conjoined rooms for the group (5 adults) was quite spacious and had two full washrooms in addition to all the beds. Breakfast seating was sometimes full and we had to wait. Bus didn't run from the airport to the hotel after 9.20pm. This made it difficult to find after 11pm. Breakfast did not cater for western tastes. Comfortable and in a good pet of town. Room size is a bit small. A little small for three people in the room. 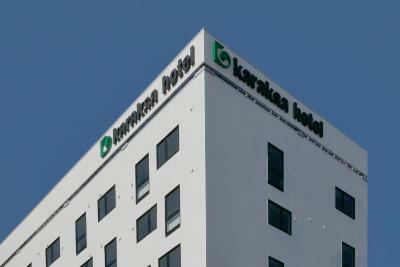 Everything was spotless, great location, courteous staff, large variety of hot and cold drinks available for free in the lobby, fast elevator, excellent bathroom, nice television, USB charging outlets in several locations in the room, small refrigerator and hot water pitcher in room, free WiFi, near by many fantastic restaurants and convenience store. Overall this was a great place to spend our three days in Osaka. Of all the countries I have visited in my life which is many I still feel that Japan is the cleanest, safest place on this Earth. The people are also the most courteous, polite people on the planet in my opinion. I'm from the United States and we look like a garbage dump compared to Japan. 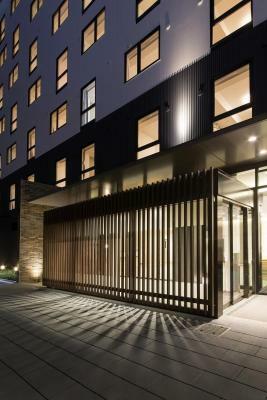 Close to shopping area , convenient to walk. The dining area is too small for the breakfast hour. Weird sound from a flushing toilet. Except for one staff who didn’t seem very patient when we asked for help to cancel and make some meal reservations. Location is good. 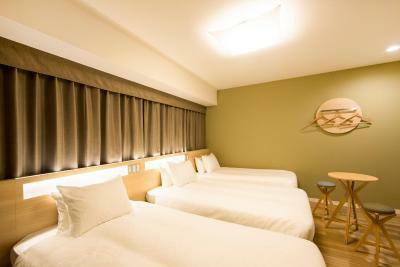 Hotel was also clean and staff were generally helpful and friendly.